Villa Chris is a 130m² 2 bedroom and 2 bathroom which can sleep upto 5 or 6 people. The villa is situated near Latchi beach and is equipped with its own terrace leading on to its own private pool and garden. The garden offers spectacular views over Akamas National Park as well as Latchi's fishing harbour. 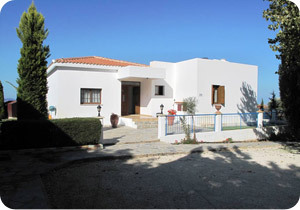 Villa Cyprus is a 130m² 2 bedroom and 2 bathroom which can sleep upto 5 or 6 people. The villa is situated near Latchi beach and is equipped with its own terrace leading on to its own private pool and garden. The sea facing garden offers spectacular views of Latchi harbour and sunset over the sea. Villa Eleni is a 130m² 2 bedroom and 2 bathroom which can sleep upto 5 or 6 people. The villa is situated near Latchi beach and is equipped with its own terrace leading on to its own private pool and garden. The garden offers spectacular views over Akamas National Park as well as Latchi's fishing harbour and beaches. 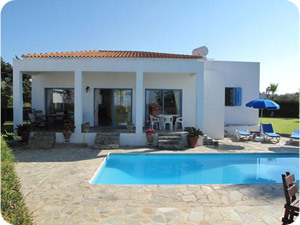 Villa Fotis is a 130m² 2 bedroom and 2 bathroom which can sleep upto 5 or 6 people. The villa is situated near Latchi beach and is equipped with its own terrace leading on to its own private pool and garden. The sea facing garden offers spectacular views of Latchi harbour and sunset over the sea. Villa Maria is a 130m² 2 bedroom and 2 bathroom which can sleep upto 5 or 6 people. The villa is situated near Latchi beach and is equipped with its own terrace leading on to its own private pool and garden. The garden offers spectacular views over Akamas National Park as well as Latchi's fishing harbour and beaches. Villa Elias is a 130m² 2 bedroom and 2 bathroom which can sleep upto 5 or 6 people. The villa is situated near Latchi beach and is equipped with its own terrace leading on to its own private pool and garden. The garden offers spectacular views over Akamas National Park as well as Latchi's fishing harbour and beaches.